The answer to my question yesterday seems to be a definite maybe. Like a lot of things, it’s tough to nail it on your first try. 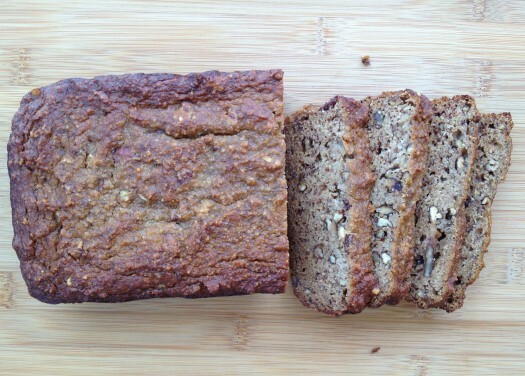 When I came across a recipe for a grain-free sandwich bread that uses coconut flour and flax meal, and the accompanying picture looked great, I thought fabulous! Here I go, with the promise of enjoying a nice slice of Paleo toast in the morning. Unfortunately, the result was less than stellar. The loaf actually looked pretty nice, especially with the sesame seeds sprinkled on top. The texture was pretty good as well, denser than a regular bread but I was expecting that anyway. No, it was the eggs that sunk this one. It smelled quite eggy when I sliced it but when I toasted it up, the eggy smell really intensified and was, for me anyway, pretty off-putting. Instead of enjoying the toast I almost gagged. Yuck. Note to self: When a bread recipe calls for 7 eggs in one loaf (7! ), you will not like it. To help erase my first Paleo baking disaster I consoled myself by making some banana bread, which was delicious, nutty and dense. Maybe I’ll just stick with quick breads for now. Adapted from Comfy Belly's banana bread -- I left out the oil, cut back on the honey, and ended up with a very enjoyable, very moist (but not greasy) loaf. One thing I enjoy with baking without wheat flour is not having to worry about over mixing the batter (and therefore ending up with a tough quick bread). Mix away to your heart's content! Within reason, of course. Preheat oven to 350° F. Line a loaf pan with parchment paper. Blend the dry ingredients together in a medium sized bowl. In a stand mixing bowl with the paddle attachment, beat the eggs together for 2 minutes, then mix in the mashed banana. Add the dry ingredients to the wet ingredients and mix well to ensure the batter is well blended. Stir in the pecans. Add the batter to your loaf pan and bake for 40 minutes, or until browned and a cake tester inserted in the middle comes out clean. Remove from oven and let cool before slicing.